East Bay Plastic & Reconstructive Surgery is a multidisciplinary center offering comprehensive skin care and plastic surgery – from consultation to cosmetic surgery through recovery. Our team of experts is recognized for their contributions to advancing the art and science of cosmetic and plastic surgery, a reputation distinguished by a high volume of procedures. East Bay Hand and Upper Extremity Surgery is a multidisciplinary practice devoted to the functional and aesthetic reconstruction of the hands and upper extremities, with special interest in injuries and diseases involving the bones, nerves, tendons, and “soft tissues”. We employ the latest orthopedic, arthroscopic, microsurgical, plastic surgical and minimally invasive techniques to preserve, restore, and improve the function and appearance of the upper extremities. We specialize in industrial injuries, including fractures, nerve injuries, carpal tunnel syndrome, “cellphone hand”, arthritis, tendon injuries, and other pathologies due to cancer, overuse, accidents, and other causes. Rejuvenating your appearance and the feeling that comes with it invigorates life… making it richer, fuller, healthier and longer. To this end, and to each of our patients, we have dedicated East Bay Plastic & Reconstructive Surgery. "Plastic Surgery is all about aligning a person's outer beauty with their inner sense of self." Dr. Douglas Chin’s extensive medical and scientific training at the world’s finest institutions has made him one of the premier cosmetic surgeons in the San Francisco Bay Area. A graduate of Harvard College, where Dr. Chin studied under no fewer than three Nobel Prize winners, Dr. Chin attended the Massachusetts Institute of Technology and Harvard Medical School, where he received both medical and graduate degrees. Dr. Chin then received his general surgery training at New York University and Bellevue Hospital prior to completing his plastic surgery residency at the internationally renowned NYU Institute of Reconstructive Plastic Surgery. Dr. Chin’s exceptional skills allowed him to study under some of the world’s finest plastic surgeons in both Manhattan and Los Angeles. Prior to joining East Bay Plastic & Reconstructive Surgery, Dr. Chin served as Clinical Instructor in the Division of Plastic Surgery at UCLA, where he was a Fellow in microsurgery and upper extremity reconstruction. 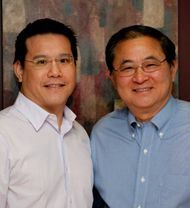 Dr. Chin’s knowledge and experience are shared in over 50 scientific and medical publications and lectures. He is known throughout the community for his sensitivity to the needs of each and every patient, his individualized care, and his dedication to providing the highest quality of medical and aesthetic care. A graduate of Boston College and Tufts Medical School in Boston Massachusetts, Dr. Lau received his General Surgery and Plastic Surgery training at the University of California in San Francisco. A member of the American Society of Plastic Surgeons and the Lipoplasty Society, Dr. Lau is a respected leader in the Bay Area plastic surgery community. He has performed over one thousand cosmetic and reconstructive surgery procedures.